Sometimes an ordinary dog bed just isn’t enough. Take a look at these magnificent luxury dog beds and find something amazing for your pet. You can choose a cuddle bed, a sofa, a more traditional dog bed or a cave for your dog. With so many choices you’ll be able to find exactly the right one to suit your pet. All of the dog beds shown below are comfortable but we’ll start with one of the most comfy beds you’ve every seen. If I had the choice I’d be buying one of these for myself. They are so incredibly comfortable. Your dog can relax in pure luxury with a donut cuddler bed. 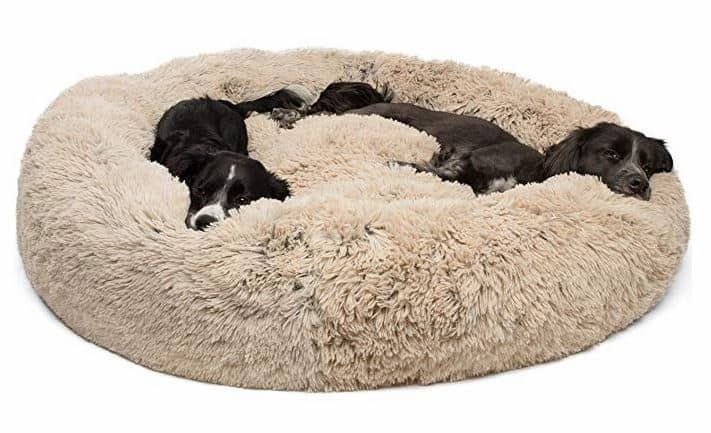 I absolutely adore this faux fur luxury cuddler dog bed. Dogs look so content on this bed. If you’re looking for a new dog bed it’s worth knowing that this one is available in 4 different sizes. Whatever the size or breed of your dog, you should be able to find one of these that suits. The donut cuddler pictured above is the largest size. As you can see from the photo, if you want two dogs to share a bed, this works really well. Otherwise you can use this for a larger dog. Take a look at the sizes here and you can also see the two color options available, Frost and Taupe. These are perfect for small, medium or large dogs depending on the size you choose. Is this one of the luxury dog beds that’s washable? Yes, this bed is machine washable. And it’s not only the cover, it’s the whole bed that is washable. The cover is not removable. You can place the entire dog bed into your washer to get it clean. If you have a front loader it is easy to place it in there for washing. It’s similar with a top loader that doesn’t have an agitator. But if you do have a washing machine with an agitator in the middle then you’ll need to take care to balance the load with something else. You can also tumble dry on low heat. This Sheri Luxury Shag Faux Fur Donut Cuddler Bed is made from nylon and faux fur. The base of the bed is water resistant to stop any accidental messes reaching your floor. The bed is cozy and lets your dog burrow in for a restful sleep. The rim is raised to provide both a sense of comfort and also to provide head and neck support. And the super-comfy filling offers joint and muscle pain relief. This luxury dog bed really does think of everything for your pet. Such comfort! Most of the dog sofas are for small to medium dogs. There are some great designs available in dog couch furniture. This dog sofa (pictured above) is for small breed dogs. It can take pets up to 12 lbs. The dimensions of the sofa are 26.5 x 16 x 16 inches. If your dog likes to curl up to sleep, this is perfect. The curved ends lend support and provide a secure sleep space. You’ll love the stylish gray and white color scheme for this dog couch. It goes well with traditional or modern home decor. By being raised up on legs this dog bed provides good protection from cold floors. 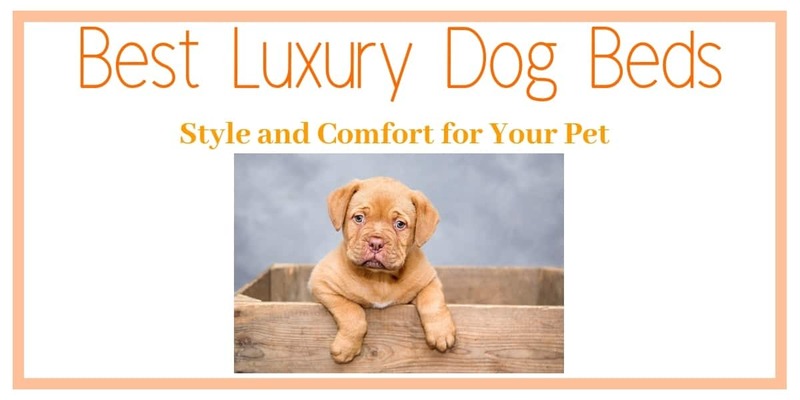 If you’re looking at luxury dog beds, you’ll be wanting to keep you dog cozy and warm. The cushion is removable and washable. This is a high quality piece of furniture. Most dog beds are not really furniture but this bed really is. If you’re looking for a high end product that offers comfort to your dog and style to your home, you’ll love this luxury dog sofa. This dog sofa can accommodate pets up to 30 lbs. The neutral color is suitable for all homes. The cushion cover is removable and washable. You’ll need to use a cold machine wash and a cool dryer setting. Similar, to the last dog couch, this one offers elevated sleeping keeping your dog away from a cold floor and drafts. The dimensions of the bed are 33.4 x 20.75 x 12 inches. The cushion measurements are 21 x 15 inches. The cushion is supportive for medium size dogs. If you’re looking at luxury dog beds that don’t really look like a dog bed, then this is what you need. This is a high quality piece of furniture. It is the sort of furniture you can leave in the living room when guests are expected and they will think it is part of your decor. The color of this luxury pet bed is caramel (a bit darker than what the picture shows). If you’re wanting a leather look for your dog sofa then this is the one. 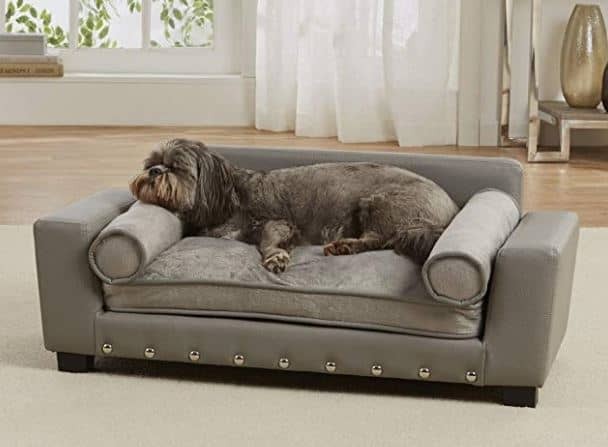 This dog couch is made from gray pebble faux leather with a plush cushion and silver nail head trim. This is a high end dog bed. It can take dogs up to 20 lbs in weight. If your dog likes to use a bolster under the chin, this provides two of them. This is one of the best luxury dog beds with bolsters. The bolsters can also be removed to provide more space on the sofa. This is the sort of dog bed you can display proudly. It is a real piece of furniture and a stylish one! And if you want a bolster dog bed for your pet, this will suit you. It comes in gray and the sitting area dimensions are 22 x 13 inches. Some dogs want to feel secure when they sleep by being inside their dog bed. This is a cave style pet bed. You can choose a floppy, soft cave style bed or a more structured form. If you have a small dog that likes to snuggle into their own space to sleep then take a look at this clever dog bed which can be used for one or two small pets. Your pets get two comfortable areas. The lower area is within the structure and then there is another bed to lie on at the top. This is ideal if you have two small dogs or a dog and a cat. 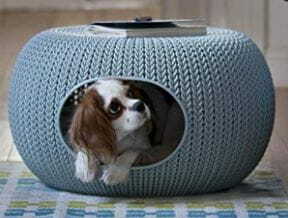 If you only want to use this dog bed for one pet, you can turn it upside down and use the bed inside while using the exposed knit inspired pattern at an end table (see the picture to the right). This is a unique design you can really take advantage of. Both cushions (the one on top and the one inside) are removable and washable. The outside of this dog bed is durable and easy to clean. It is made from polypropylene resin plastic. This is weather-resistant so this luxurious dog bed can be used on a deck or on the porch. It is easy to wipe clean. So, if you’re looking for a structured cave bed for your dog to feel comfortable and secure, this one ticks all the boxes. What about a soft cave bed for my dog? This soft cave-like bed comes with a built-in hood to keep your dog feeling cozy and secure. The round shape adds to the secure sleep environment. The cushioned walls provide head and neck support. This bed is available in two sizes, for small dogs up to 25 lbs or medium dogs up to 35 lbs. And it is available in 9 different colors (click here to see all the colors). The lining is soft faux fur for your dog to snuggle into. The base of the bed is water resistant. The entire bed is machine washable. The small size has the following dimensions: 24 x 24 inches. The medium size is 27 x 27 inches. If you’re looking at luxury dog beds, you want premium quality. This Sheri Cozy Cuddler bed is made from super-strength, durable, pet-friendly fabrics. This is a high quality bed for your pet. ⇒ Are you looking for XXL Large Dog Beds? Take a look at the best here. ⇒ Do you need a cooling elevated dog bed? See these. ⇒ Does you dog have joint problems? See the best dog ramps for your car. This entry was posted in Comfort & Mobility on September 2, 2018 by Didi.